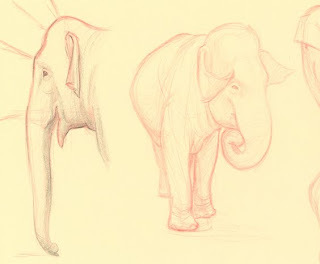 I went elephant sketching over the holidays. What fun to observe these amazing animals! 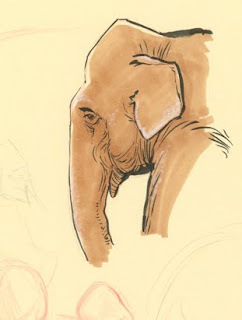 Here are a couple studies done with red pencil, markers, and a "comic brush" pen. 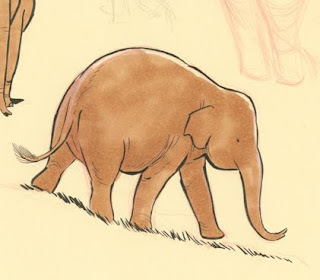 Elephants are the stars of my next comic book, so I want to get to know real elephants before I try to caricature them. Great studies Mark and thanks for sharing your development process. Good luck on the book! Thanks Jeremy. I checked out your site-- nice stuff! Yo G1, I used a Tachikawa Comic Brush pen and then colored it with Copic marker. It was my first time using both, so it was a lot of fun but I'd definitely like to refine my technique.